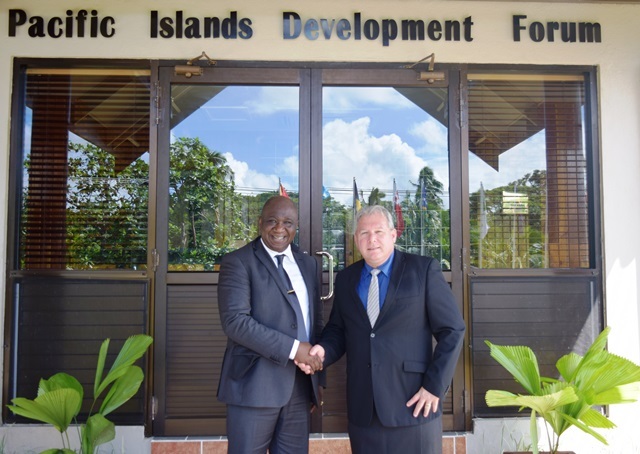 The Republic of Guinea acknowledged the accomplishments of the Pacific Islands Development Forum (PIDF) and the led role undertaken on the formulation of the Suva Declaration following a courtesy visit by the Ambassador Extraordinary and Plenipotentiary of Republic of Guinea, Honourable Sylla Senkoun, to the PIDF Secretariat on Thursday 28th April, 2016. 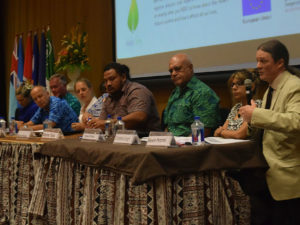 The visit allowed PIDF Secretary General, Mr. François Martel to provide an overview of the strategic direction of PIDF and their role in terms of sustainable development across the pacific island countries. 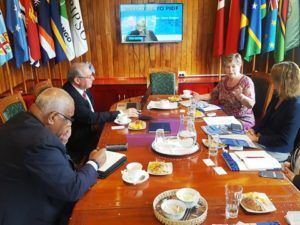 “We had constructive discussions during the meeting with Ambassador Senkoun especially for our strategic pathways forward to achieve PIDF’s mandated responsibilities within the Pacific,” said Secretary General Martel after the meeting. Mr. Martel added that deliberations also enhanced Ambassador Senkouns’s understanding on the evolution of the regional architecture, UN sustainable development processes and regional linkages. Ambassador Senkoun also shared his country experience and agreed that there are potential areas of collaboration in the area of sustainable development supporting the mandate of the PIDF and encouraged the relevantly new organisation to continue with their mandated responsibilities across the pacific.